Along with our running tests of chocolate chip cookie recipes, we continue to tinker with our homemade bacon recipes (our main bacon recipe is here). This week we made what we call “breakfast bacon”, a sweeter, “porkier” bacon we thought would go well with traditional breakfast fare like eggs and pancakes. For our breakfast bacon we made a cure with no garlic, less herbs and pepper and a LOT more sugar. In this cure we almost doubled the normal sugar, with ¼ cup of both dark brown sugar and grade B maple syrup. We also finished the bacon in the oven, rather than smoking it, with the hope that we would get the pork, sugar and salt as the dominant flavors. How did the breakfast bacon experiment go? It went pretty well, the bacon was very tasty and we had a good pork belly to work with, so it was very attractive, meaty bacon (yes, I just described bacon as “attractive”). A number of us tasted, and all liked the bacon very much, as it was both sweeter and “porkier” than our savory bacon. The extra sugar also caramelized slightly on the bacon when cooked, which a few of us liked. Overall, however, our basic recipe is still the favorite. 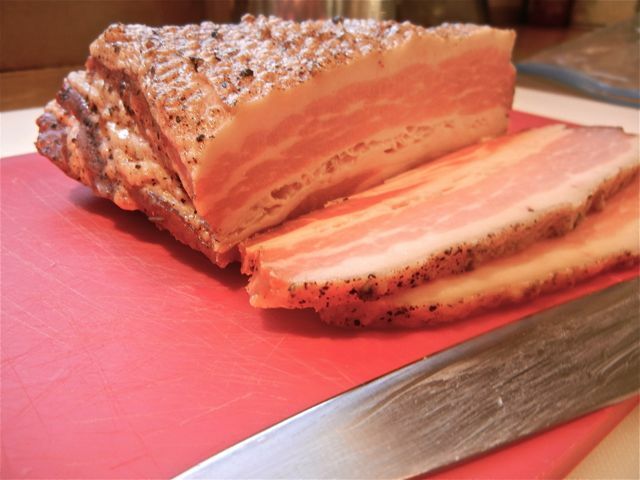 The touch of garlic and stronger herbs still make for a more versatile bacon with a wider range of flavors- good for breakfast, lunch and dinner. But if you are a sweet tooth or like a very basic cure on your bacon, this breakfast bacon is a good recipe to try. (Ed. Note: It has been raining, so some of our experiments smoking the bacon with different wood have been postponed- more to come in April). – Find somewhere you can buy pork belly. A few calls to your local butcher shops should work, but it is not as easy to find as one might think. Internet mail order is also an option. 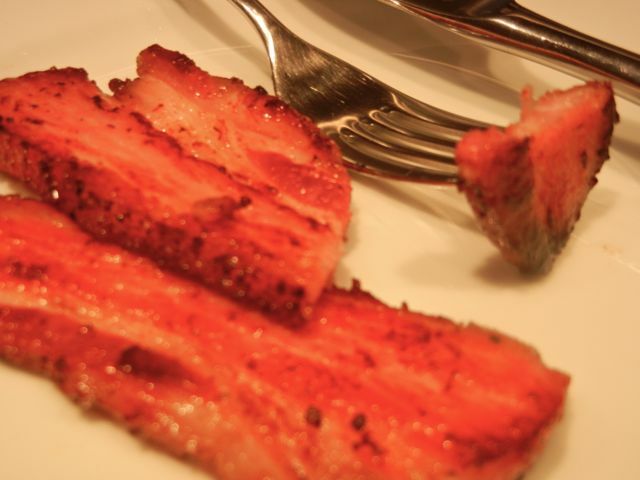 – You can use pork belly with skin on or off (you may not have a choice) but if you do not want to use the skin, it will be useless added weight. What You Get: Very clean, lightly flavored, sweet bacon. What You Need: The only special equipment required is curing salt (sodium nitrites)- which is safe in the small amounts used, it should be kept away from children. Otherwise you need a few sturdy 2- gallon ziptop plastic bags or a big plastic container(s). Space in the fridge for 7 days for curing. An accurate meat thermometer and a scale are very helpful. How Long? : 10 minutes of prep. 7 days of curing. About 3-4 hours of cooking or smoking time. If you start on a Saturday morning you can have bacon the next Saturday evening and you will be ready for a truly awesome Sunday brunch. 5 lbs. fresh pork belly. Skin-on or skin-off. It is OK to slice the belly into pieces to fit in your bags / containers. 2 oz. Kosher salt (1/4 cup), Kosher salts vary in size of crystal- using weight is better. Thoroughly mix salt, curing salt garlic and all the herbs/spices in a medium sized bowl. Add pork belly to bags or plastic container. Add curing mix to containers- rub onto belly. Take you time and get an even coating. Seal container / bags. If using bags, seal and place on a sheet pan. Add to fridge. (It is wise to add a post-it note with date and time). It takes 7 days to cure, halfway through cure open containers and spread out the cure again on the meat. You will see some liquid has been drawn from the belly- this is fine. Keep the liquid or drain. After 7 days, take out the belly and rinse with cold water. 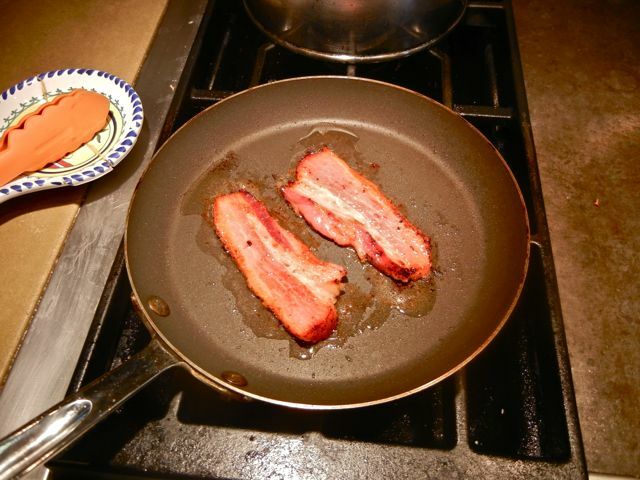 To finish bacon, preheat oven to 200 degrees (you can also smoke the bacon- but that is another recipe). Place belly on a sheet pan or rack on sheet pan (better). Cook until internal temp is 150 degrees. This may take up to 4 hours depending on the size of your piece of belly. Slice it up and cook it! Eat, repeat.